Manage challenging classroom behaviour more easily with this DVD. 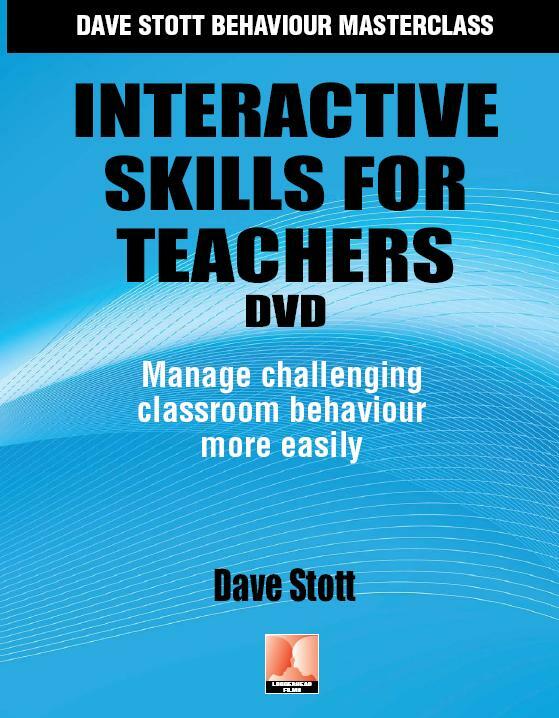 This DVD helps you understand challenging behaviour in a classroom situation and shows you how to apply this knowledge to develop a calm and confident teacher response. - use personal space for best effect- develop your own self-calming strategies in managing difficult behaviours. response, including passive verbal and body language, speed of approach, pleading, threatening and giving up. Section 3 focuses on personal space and moving in – and the effect on both the emotion and the behaviour of teacher and pupil. memory’ – for a natural, automatic teacher response. Section 5 concludes with a question and answer session with the studio audience, including some key ‘What if’ questions. Dave Stott is a leading UK trainer, consultant and author in pupil behaviour management. He believes good behaviour can be taught and that teachers need to be well prepared in their response to any given situation. literacy, anger management, behaviour, inclusion and reintegration work across all phases, in both mainstream and special education. This DVD is also available as an intranet version which can be stored on your server and allows easy access to everyone in the establishment.